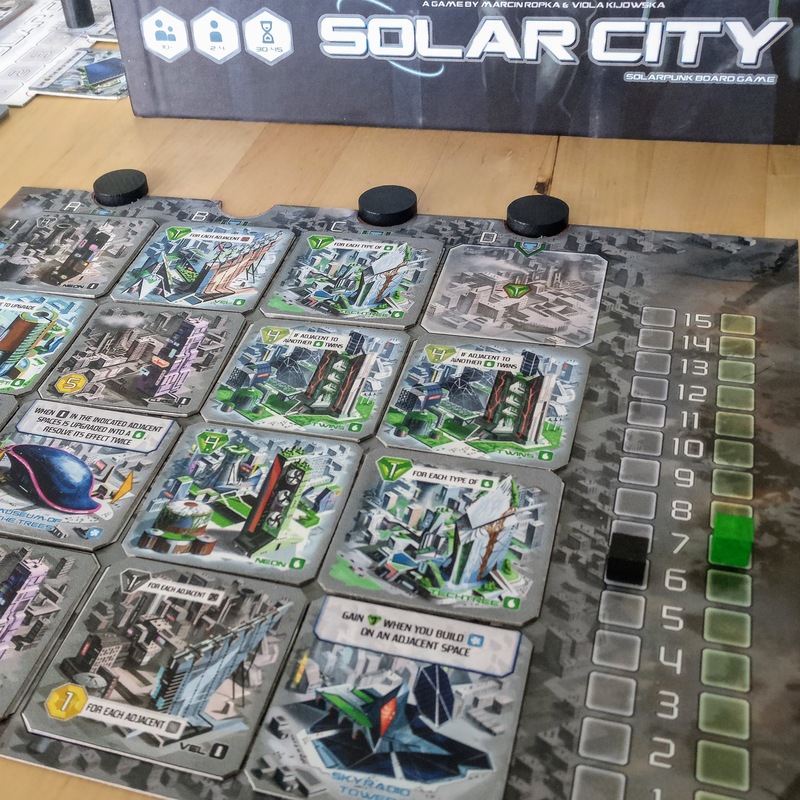 UPDATE: This Kickstarter campaign for Solar City is now live. 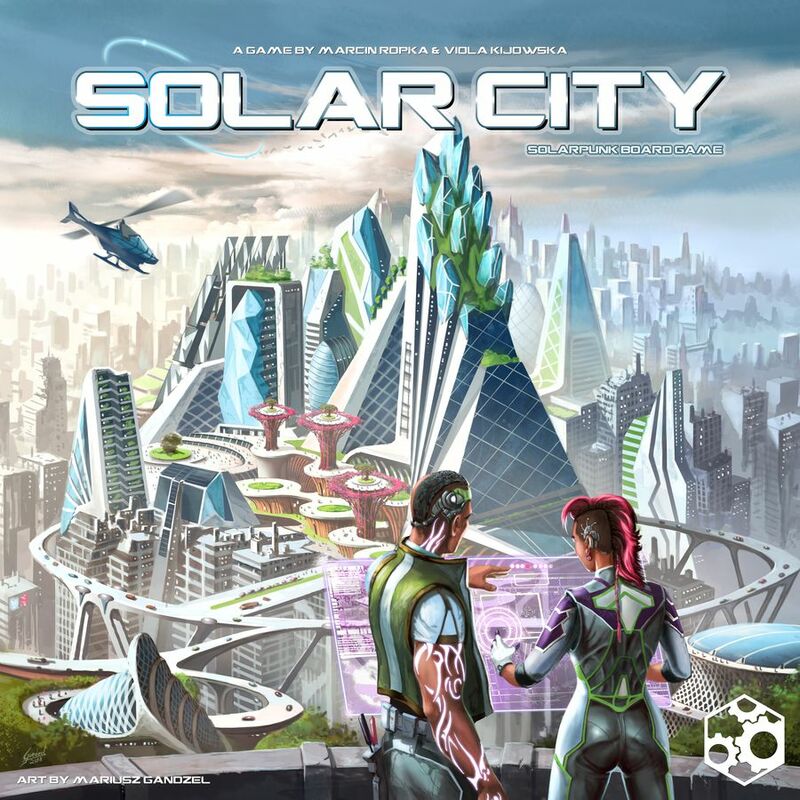 The premise of Solar City is quite simple (as it is with most great games). On each turn you either acquire a new Skyscraper (that you put in your personal 4 x 4 grid) or upgrade an existing Skyscraper into a SkyGarden. The cost is based on the number of Skyscrapers / SkyGardens you already own. In either case you get to “activate” the row or column where the Skyscraper / SkyGarden your just built / upgraded, is. This is where the game gets clever. You get to activate all of your Skyscraper in the row or column you just chose. So if you plan things well you can trigger multiple Skyscrapers each turn. But (there is always a but isn’t there?) things are not quite so simple. Because what every row / column you activate will get locked, not only for you but for all other players too, until the end of the round. So people can mess up your plans this way and you can mess up their plans. It’s a great way to introduce interaction in a game that would otherwise be a solitaire city building game. Let me get back to difference between Skyscrapers and SkyGardens. Skyscrapers typically generate money and activate as part of the row / column. You need the money to buy more Skyscrapers and upgrade them to SkyGardens.The more Skyscrapers you own the more expensive it is for you to build more of them, and the same goes for SkyGardens. Turning a Skyscraper into SkyGarden will score you points in various ways, but unlike the Skyscraper this is a one-time thing that can’t be repeated, and the building will no longer generate you any money. You ofcourse need points to win, but it will mean you sacrifice a way to get income. It’s a marvelous dilemma that’s one of the highlights of the game for me. This mechanism in itself is super interesting, but add to that the fact that most Skyscrapers will generate money based on a criteria that’s the direct opposite of how it will generate points. This can be things like it’s location on your grid, it’s adjacency to other buildings and so. And I didn’t even tell you about the Public Structures yet. That I’ll leave a mystery for now. Suffices to say they add a little extra to game, along with permanent abilities and end game scoring bonuses. 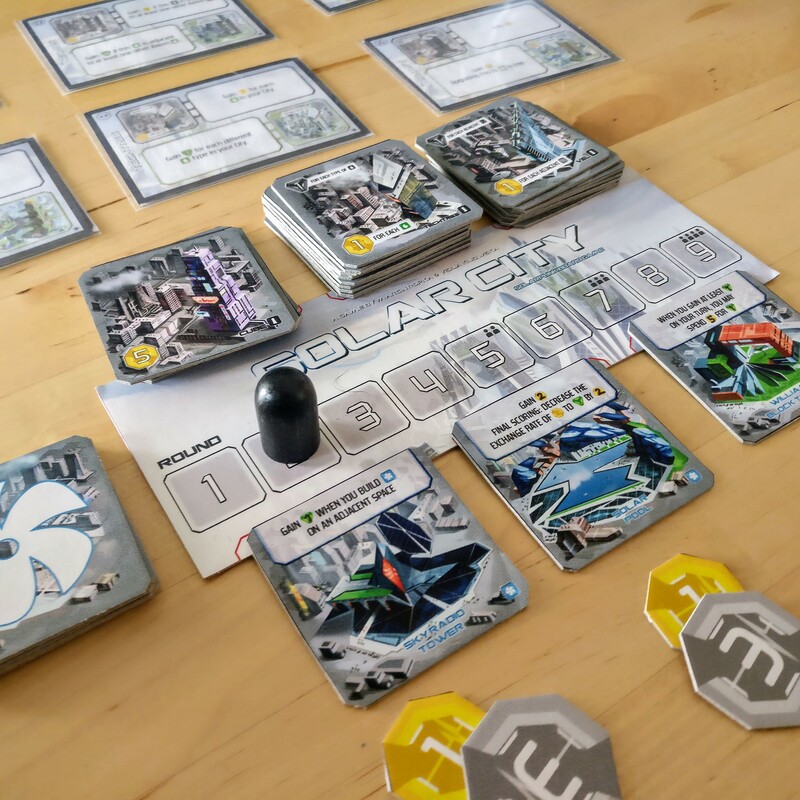 So to sum it up I think Solar City is a marvelous game. It offers a great new take on city building genre as well as a wonderful balancing act. 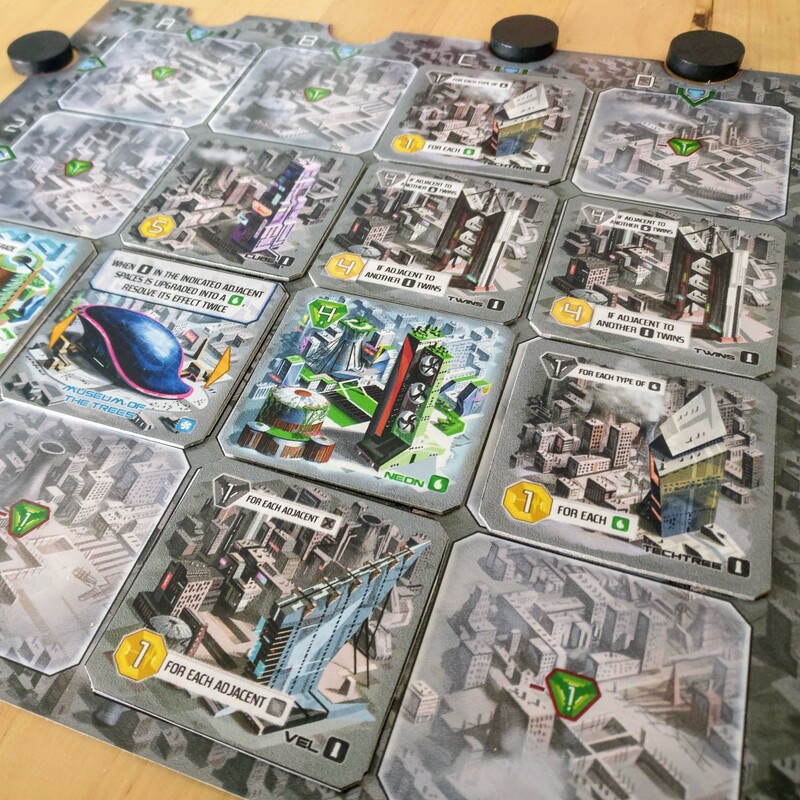 The puzzle of figuring out where to place your Skyscrapers on your board, and deciding when to upgrade them to score points, is such a great idea and executed so well. 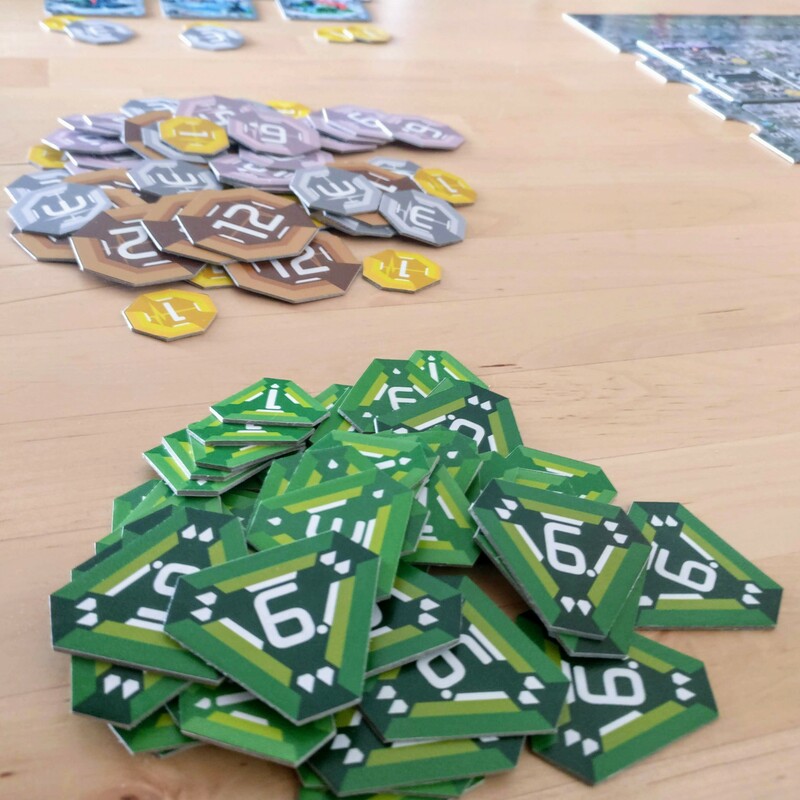 You only play with 6 different building types, but 12 where in the prototype I played, and more than 20 will be included in the final game, giving the game near endless variability and replayability. I can’t recommend this enough. It will be a big contender for Top 6 Games of 2018 and might even sneak into my all time Top 6 Games. Grab your Skyscraper or Public Structures here! Please note that all the pictures above are of a prototype of Solar City. The final game will include better graphics and other tweaks. The art on the tiles seem to make the board overall look very busy – was that a hindrance at all when playing? Was information a bit more difficult to discern amongst all the shapes? The pictures are of a board near the very end of the game. The information slowly builds up during the game so I feel it’s easy to absorb. Also the icons are clear and the text short and to the points. On top of that the images are of the prototype of the game, the finally version will have tweaked graphics. Glad you got a chance to try it out. I love the way the interaction works too.